Bobbers are a popular fishing accessory. They float along the surface of the water with the hooks and bait dangling below them. When a fish bites onto the hook, the bobber is pulled underwater, indicating to the fisherman that he has a bite. Bobbers are an excellent visual aid for all those who love to fish. String the fishing pole. Be sure that you attach the line firmly to the reel and put enough new string on your pole that you have ample line to fish with. Cut the line when you have enough strung onto the pole. Tie the bobber onto the end of the line. A bobber should have a loop or hook at the top that will be used to attach it to the main fishing line. Tie two or three very secure knots in the line to assure the bobber does not come loose. Prepare the hooks. Most bobbers work best when strung with only one or two hooks, so don’t prepare too many. Make sure you tie the hooks firmly to the end of the lines to avoid losing any fish. Attach the hooks to the bottom half of the bobber. You should find a small hook or other loop on the bottom that is specifically designed to hold hooks. Tie the hook sections to the end of the bobber and secure them tightly. Bait the hooks just before you cast the pole. You can use whatever type of bait you like, as long as it will slide over the hook. Apply your bait of choice to the hooks well and cast the pole well into the water. Adjust the tightness of the line in the water and wait for the bobber to move. 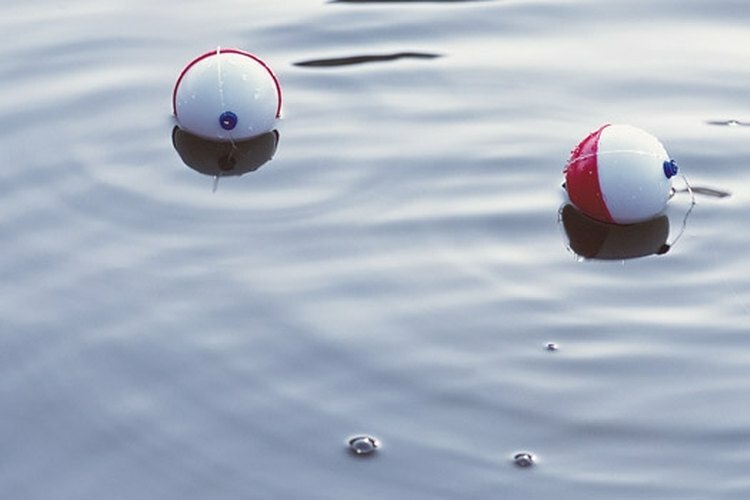 The bobber will bob up and down gently as the water moves, which is normal. However, when a fish strikes the hook, you will notice the bobber go a considerable distance into the water, or even completely submerge. Pick up your pole and move it quickly in an upward manner, setting the hook into the fish’s mouth. Reel the fish in and remove the hook from his mouth. Be careful not to damage the lines or bobber so that you can cast the pole out again quickly and continue enjoying the new bobber setup. Use only good quality, undamaged bobbers. Cracked or broken bobbers will take on water and will not work well. Do not catch yourself with any hooks. They are very sharp and can be painful if they become lodged in your skin.